This classic pasta sauce is as basic as you can get but it’s also one of the most versatile. Simply adding ingredients helps create a delicious branch of this heavenly sauce. We’ve added shrimp, tuna, salmon, mushrooms, peas, ricotta cheese, peas, sausages, cherry tomatoes, fior d’latte (mozzarella), rapini – endless variations. Given time, we’ll publish some of our favorite variations. For now, we’ll start with the basics. 3. When the pasta is almost ready, take a bit of the pasta water and add to the garlic and oil sauce. This will help the sauce adhere to the pasta better. Combine the pasta with the sauce in the sauce pan. 4. 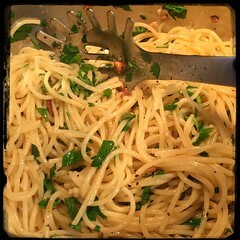 Fold in 3 tbsp of olive oil, the chopped parsley, and salt and pepper (to taste). Try adding a can or two of tuna fish into the mixture. (Use seasoned bread crumbs rather than the cheese).